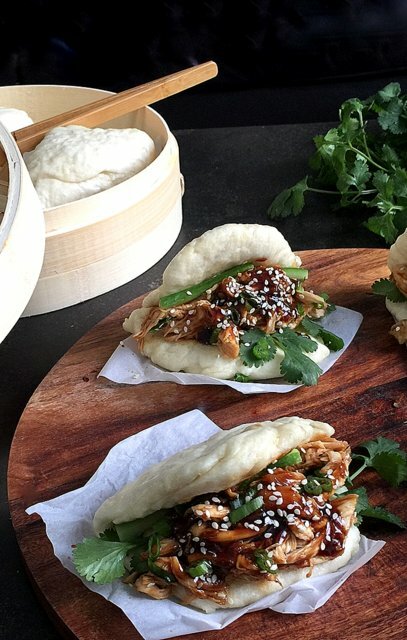 Soft and fluffy steamed Bao Buns with shredded garlic hoisin chicken. These. Bao. Buns. This is my first time making steamed buns, or anything with a basket steamer, and it will definitely not be the last. It so much fun and way less intimidating than I ever thought. This holiday season I am working with Fleischmann's to get people back in the kitchen baking again. Now I feel pretty confident in the kitchen when it comes to most dishes but baking has always intimidating to me. There is something about the precision and specificity of baking that shakes my confidence. This season Fleischmann's partnered with celebrity chef Anna Olson to develop some mouth watering recipes that provide bakers of all levels (hello, novice right here!) with some tried and true recipes. 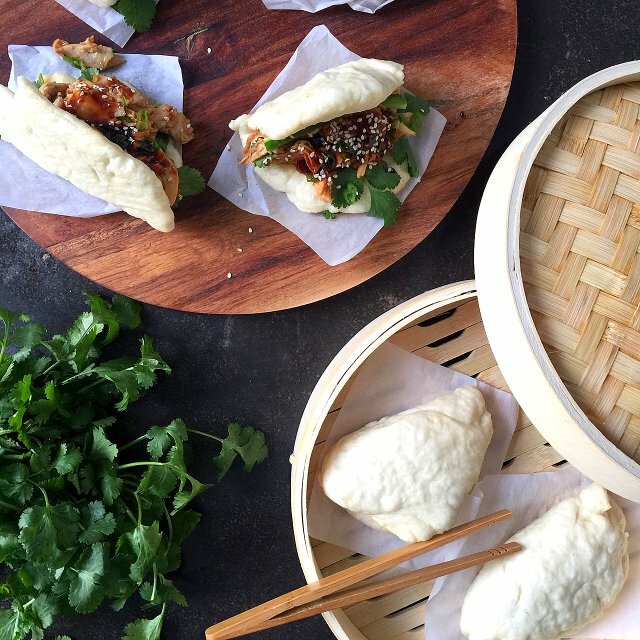 In reviewing the recipes I knew I wanted to try the Bao Buns. 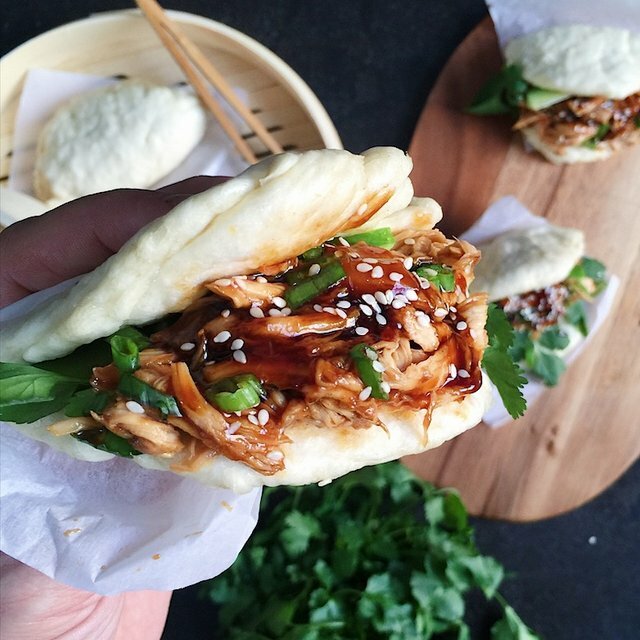 I made them twice, once with the BBQ turkey and the second time with Shredded Hoisin Chicken. Both times these little three bite buns turned out great. Light, fluffy and the perfect neutral vehicle for a flavourful protein. I think they would make a perfect New Years Eve appetizer. Fleischmann’s has also launched the It's All You Knead contest for Canadian residents (excluding Quebec). Just visit the contest site Its All You Knead, register and enter the UPC of any participating Fleischmann product with no purchase necessary. Each entry gives you a chance to win one of seven Cuisinart Precision Master 5.5 QT. Stand Mixers. A full list of rules and regs can be found on the contest site. Make the buns, enter the contest and enjoy experimenting in the kitchen this holiday season. I know I will be! Disclosure: I am compensated in kind & financially for recipe creation, photography and written content. As always, and as owner of this site, opinions expressed here are my own. 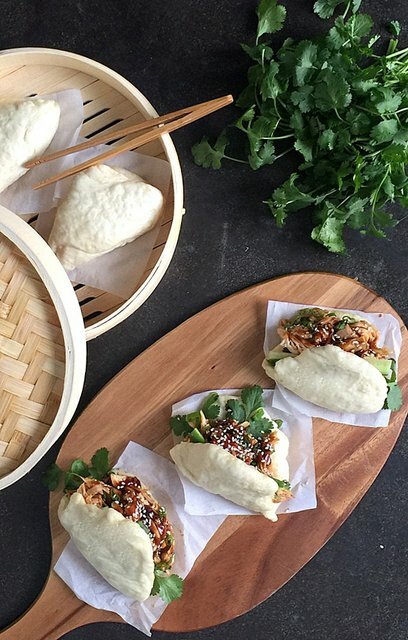 Follow the recipe at https://itsallyouknead.ca/recipes to make Bao Buns. Combine the sugar through vinegar in a small sauce pan. Bring to a boil, and reduce to a simmer for five minutes. Remove from heat and let cool.